I babysat the grandbaby last night, so I didn't get any sewing done. I did start cutting out the tote pattern I showed you a few days ago. I also picked up two new baby patterns I saw on Pattern Review. I've never sewn a Kwik Sew pattern before, so I can't wait to try them. Beware! 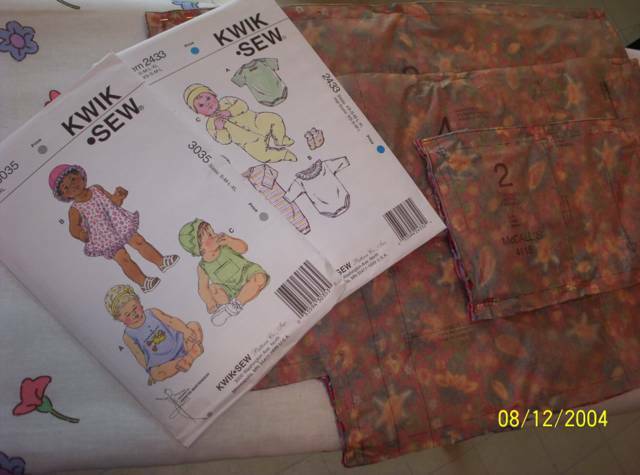 :) The first time I used a kwik-sew pattern, I was halfway through it before I realized it only allowed 1/4 inch seam allowances. eek! I don't know if they are all like that, but definitely check. thank you! Since I'm usually a direction skimmer, I might have missed that totally!